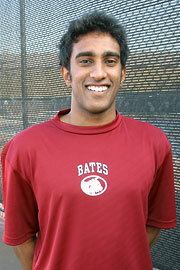 Next on Meet the Bobcats is senior Amrit Rupasinghe. 1.Where are you from and what high school did you attend? 2.What are you plans for after graduation? 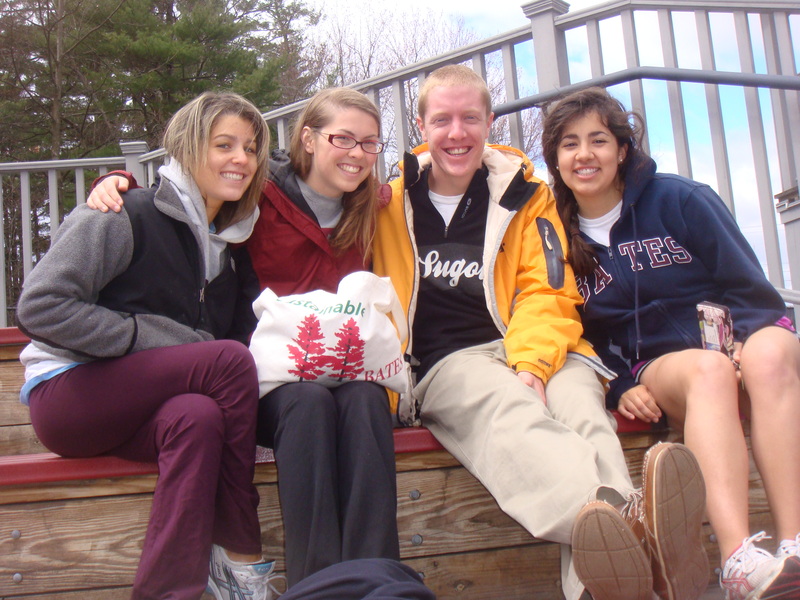 3.What is your major and what has been you favorite class at Bates? I am an Economics major. My favorite class was Technology in US History. 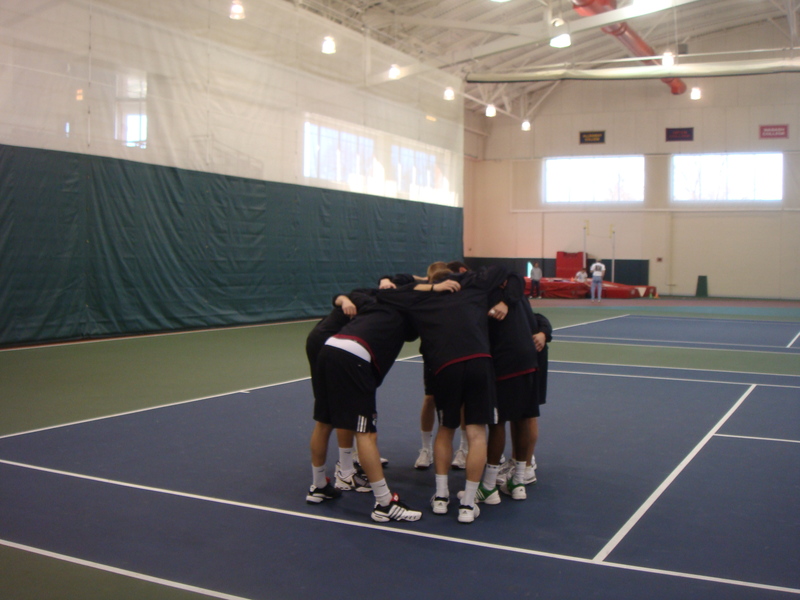 4.What is the one thing you remember most out of your doubles national championship run last season? The last two games, won at 0-40, and 40-0 after getting broken. 6.Besides tennis, what sport do you like to play the most? Favorite Sport other than tennis, to watch: basketball, to play: basketball if I actually could play, but realistically probably cricket or table tennis (if table tennis qualifies as a sport). 7.What is your favorite movie? 8.If you were stranded on an island, what three things would you want to have with you? Good music, (food/water = survival pack) and a friend. 9.What is the coolest U.S. city you have visited? 10.What age did you start to play tennis and who taught you? I was 8 yrs old. Sriyani Gunaratne first taught me. 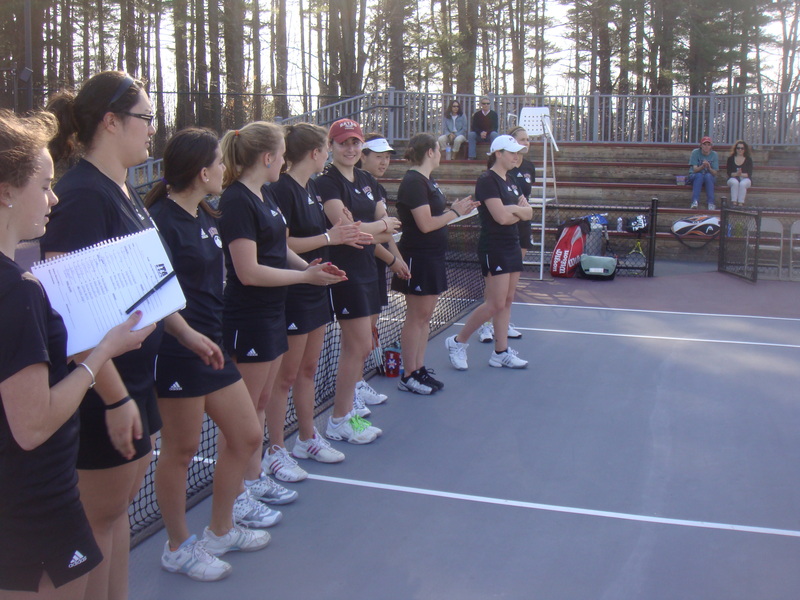 Last weekend both the men’s and women’s teams hosted the Connecticut College Camels. Even though the Camels are not ranked in the top of the conference, the matches would not be easy since the Cats hadn’t been sleeping much in the last week of the semester. Most of the members of the team had at least one test and one paper if not more due the week before the match against the Camels, not to mention final exams would follow the weekend matches. As every student athlete knows, this is one of the hardest times of their college career. The women played Conn on Friday night and were forced inside due to rainy weather. 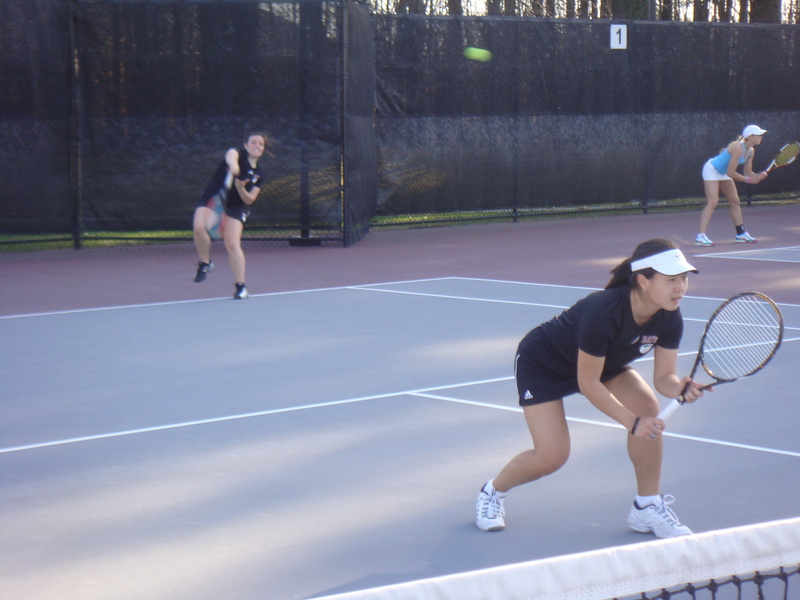 The Cats jumped on their opponents early, with Erika and Katie at #3 doubles leading the way. They overpowered their opponents and never let up, winning the match 8-0 by coming through on every big point. This took some of the pressure off of the #2 doubles team of Ashley and Nicole because they were down a break early in their match. They were able to finally break back and then hold for the lead. In the final game, Conn had been hitting great down the line shots when both Cats were at net, but on match point Ashley was there for the perfect volley right through the middle of the opposing players. Nicole and Ashley had just given Bates their second point and celebrated with a big high five before shaking hands with the Camels. It would then be up to the #1 team of Alex and Meg to give the Cats the commanding 3-0 lead heading into singles. Alex and Meg had a lead for almost the whole match and had a chance to serve it out at 7-6 but their opponents played well enough to force the match to a tie-break. With the heartbreaking tie-break loss from the Bowdoin doubles match a few days earlier, the Cats weren’t about to let this one get away. Alex and Meg got an early lead in the breaker and then Alex served a couple of big serves to end the match. 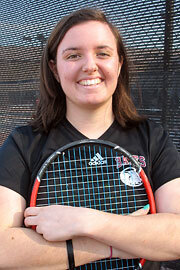 Ashley led the way for the Cats in singles, dominating her opponent to get the tidy 6-3, 6-0 victory. Her win gave the Cats their fourth point, only needing one more for the win. That win would come from Katie at #3. Her first set was a close one with many games going to deuce. Eventually, Katie found herself in a tie-break, but no matter what her opponent did; Katie refused to lose and came out on top with the 7-4 win. 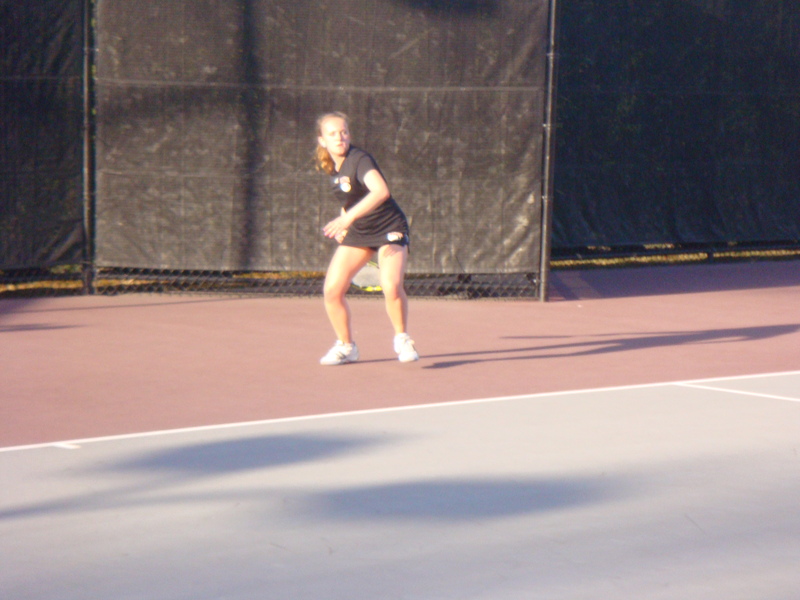 In the second set, she really put on the pressure and won easily 6-0, clinching the 2nd conference win of the season. 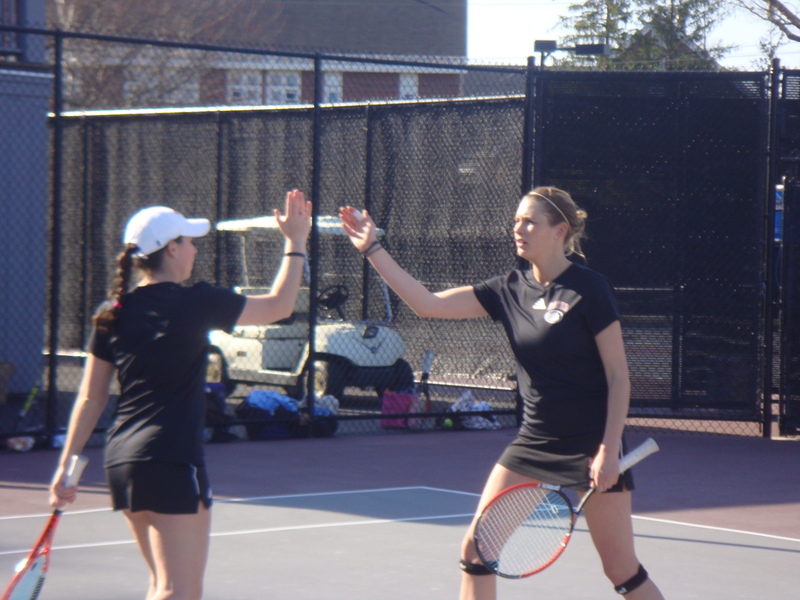 Even though the match was decided, Erika and Nicole showed their focus by taking it to their Camel foes. It can be easy to let down the intensity once the match has been decided, but there was none of that at the #5 and #6 positions for the Cats on Friday night. The Cats could have made this match much tougher if they had not won the big points and not kept their intensity on every point, but they showed how quickly they are maturing with this win. Senior day for the women will be this Sunday against Hamilton as we have a chance to thank Alex and Jean for all they have done for the program over the last four years. Then the women, along with the men will head south on the April break trip to play TCNJ, Trinity, and Wesleyan. After the women won on Friday night, the men knew it was their turn to complete the sweep on Saturday afternoon against the Connecticut College Camels. The doubles pair of Rob and Zach never gave their opponents a chance at #3 doubles as they won in under 30 minutes by a score of 8-0. Amrit and Bettles, at #1, came out firing and won by the same score. 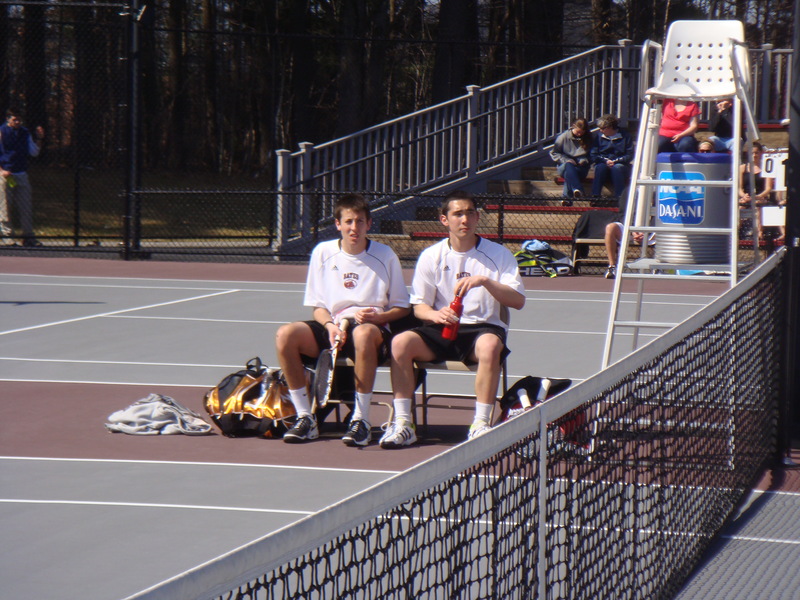 So with the Cats up 2-0, the drama once again came from the #2 doubles team of Max and Jeff. 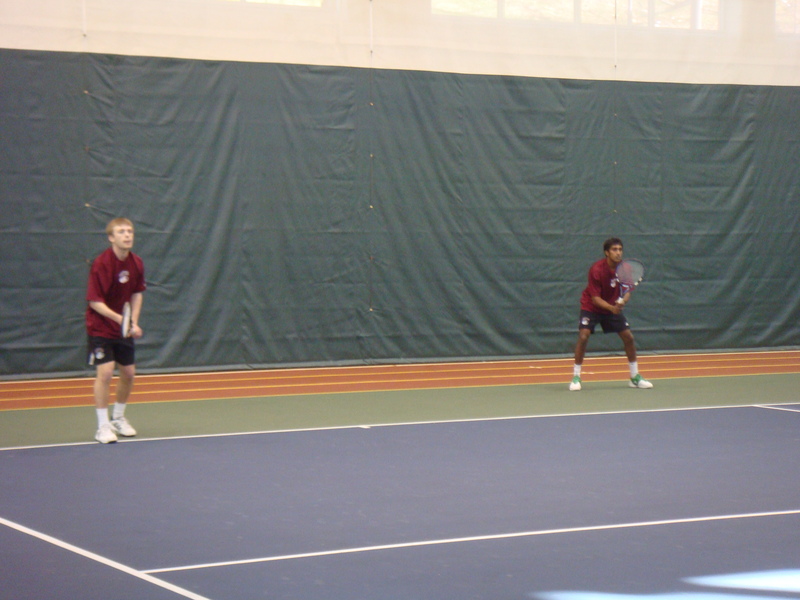 Playing against two very athletic, tall players, Max and Jeff found themselves locked at 6-6 returning serve. As the game went back and forth from deuce to add and back to deuce again, everyone knew how important this game was. When the Camels had a game point, Jeff was able to barely dig a short ball back over the net and then two volleys later Max hit an unbelievable overhead right through the two opposing players. The Bates pair used that momentum to get the break two points later and take the 7-6 lead. 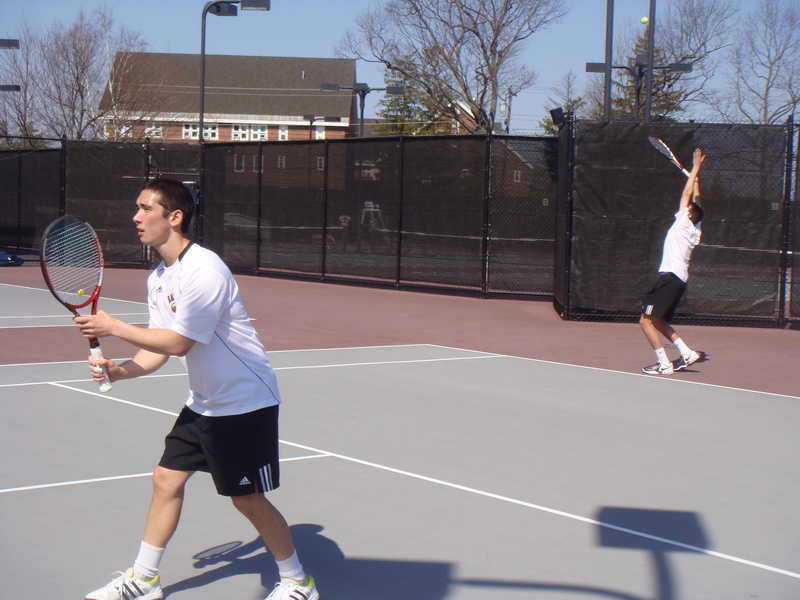 They would then hold serve to give the Cats a 3-0 lead as the teams entered the singles play. In the singles, no Cats had any real problems. Amrit, as usual, played very entertaining tennis full of great shot making and athletic volleys. Max, with his steady game, wore down his opponent until he finished with a 6-1, 6-1 win. 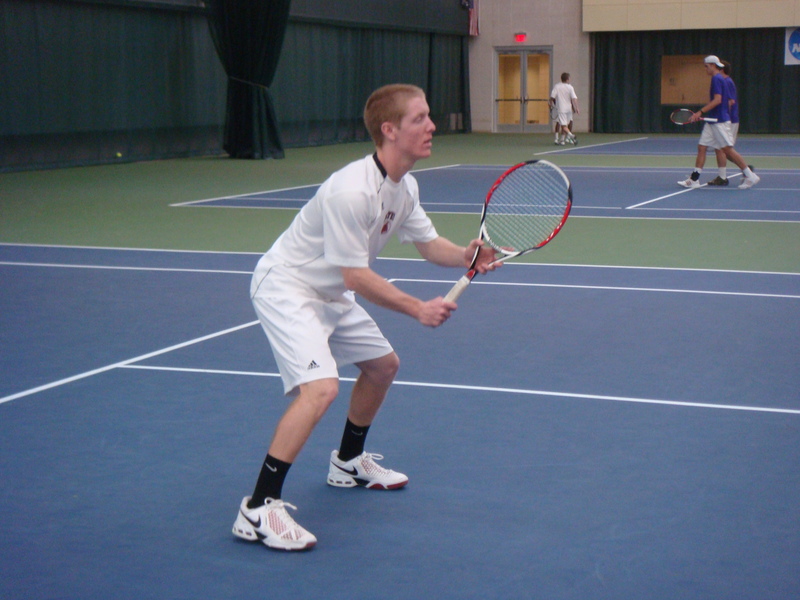 Bettles won his 6th singles match in a row with his win at #3. Reiss was all business and used his attacking game to get an easy win. 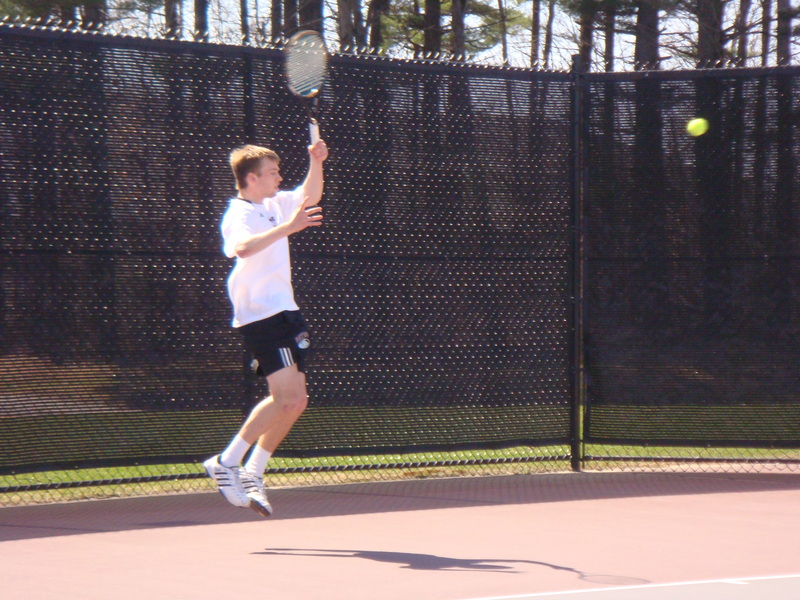 Rob, at #5, used his big serve to hold serve every game in route to a 6-1, 6-2 victory. Fenno finished off a perfect day with a win at the #6 spot. 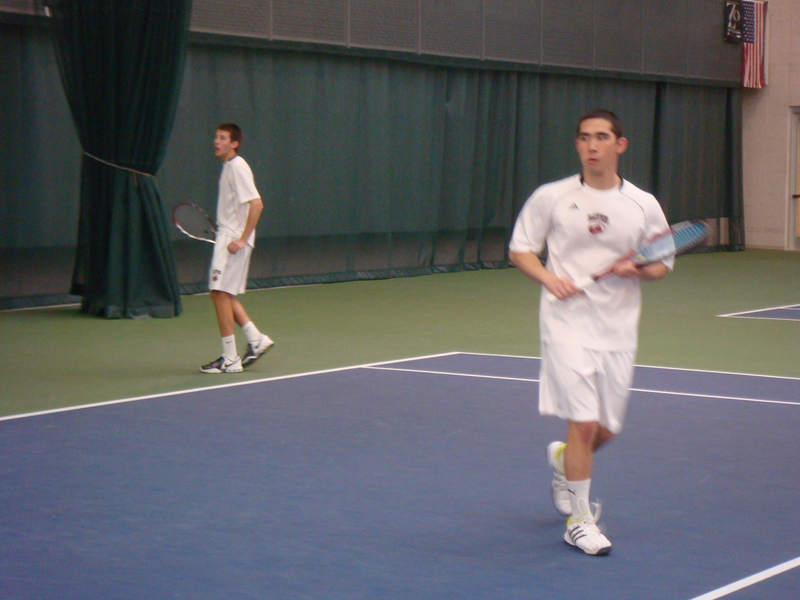 Dylan also joined in on the winning as he won an exhibition match. It was a good couple of days for the Cats with both teams winning. As I said earlier, the men will play against Hamilton at home on Sunday, and then head south with the women to play three matches over April break. 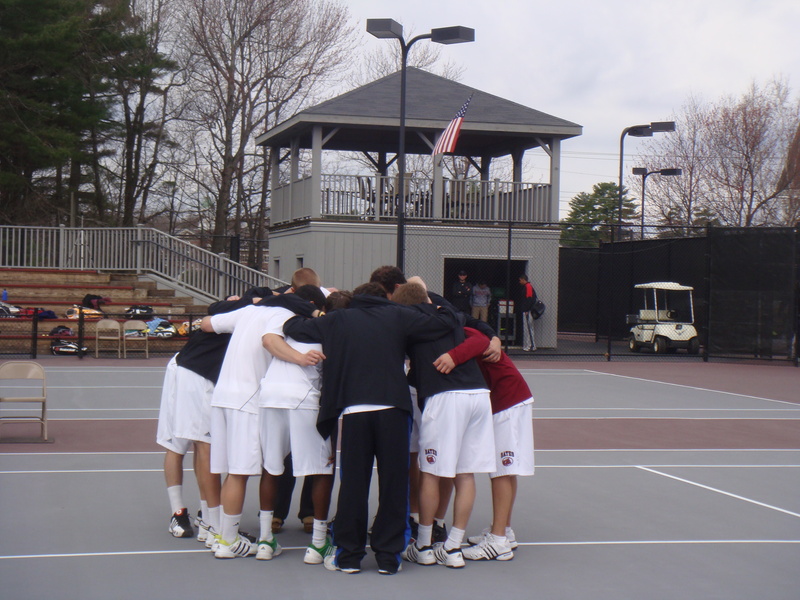 The men’s last home match and senior day will be against Tufts on May 2nd. Be sure to check back here to see how the April break matches turn out. 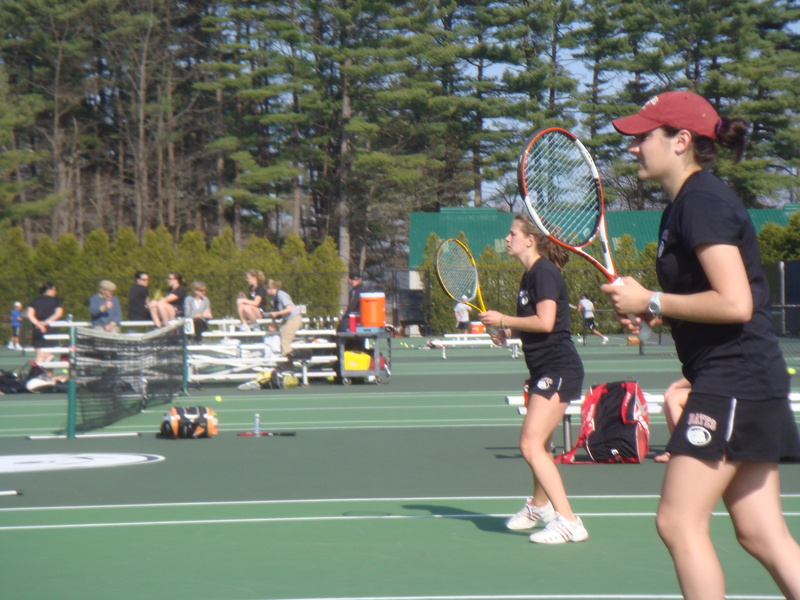 This past weekend both the men and women played home matches, unfortunately both had tough losses. 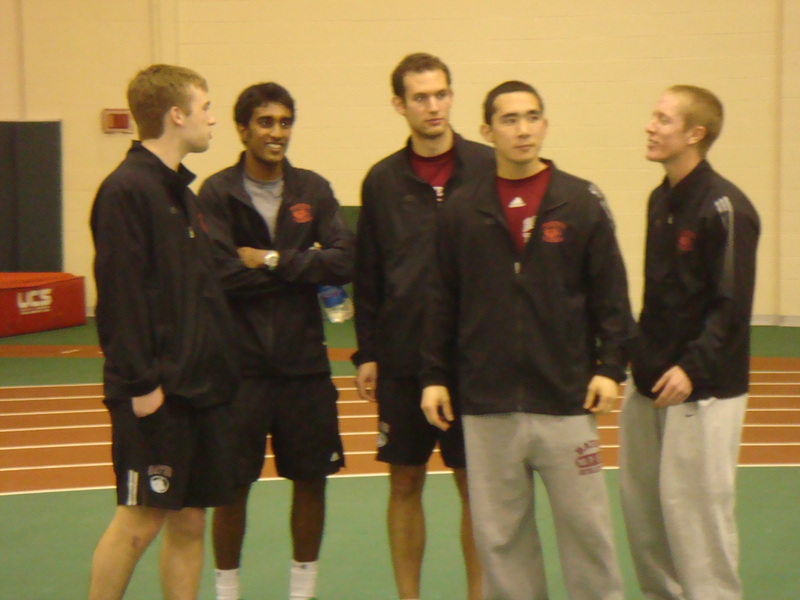 The men lost to #1 ranked Middlebury and the women lost to #17 Tufts. Instead of writing about the matches, here are some pictures that tell a small part of the story. Next up on Meet the Bobcats is freshman, Jenna Burke. I am from Burlington, Massachusetts and went to Burlington High School. 2. Why did you choose Bates? friendly people I wanted to get to know more. 3.What do you plan to major in? I plan on double majoring in Chemistry and Environmental Studies. 4. What is your favorite food/meal at Commons? My favorite meal at Commons is the pad thai. 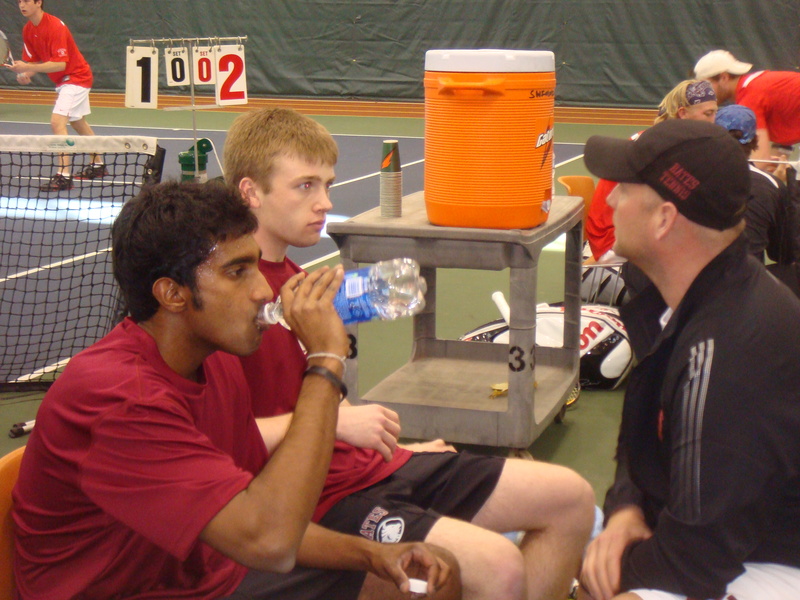 I plan on taking courses over the summer and coaching some tennis. 6. Favorite tennis team memory so far this season? match), the rage cage, and catch phrase. 7. What artist is getting the most time on your iPod? Sufjan Stevens gets a lot of playtime on my ipod (perfect to study to). I want to travel to Africa very badly. 10. Red Sox or Yankees? I am definitely a member of Red Sox Nation. The trip to Ohio started on a sunny Thursday afternoon here in Maine, and it ended with a late night flight back to New England on Sunday. 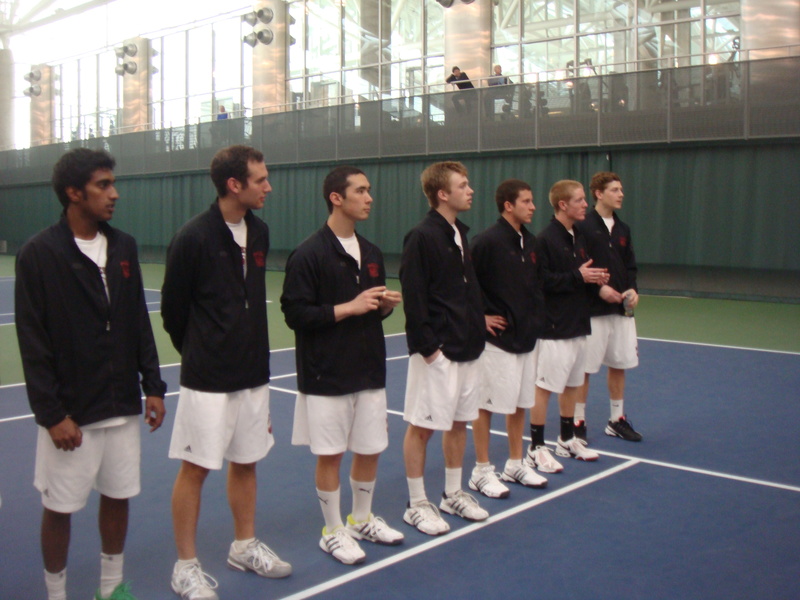 When the men’s team traveled down to Boston at the beginning of the weekend they weren’t sure what to expect as they were scheduled to play some unfamiliar foes during their three days in the Buckeye state. However, the Cats did know three matches in three days after spending all of Thursday traveling would make for a long weekend, but as always they planned to Enjoy the Struggle. First up on Friday afternoon was Denison who was ranked #9 in the Central Region. 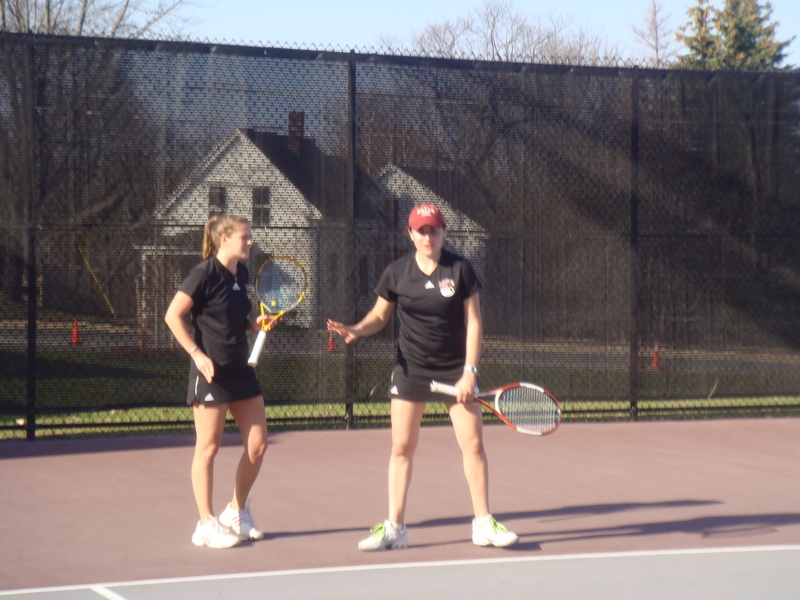 Denison traditionally plays very smart and good doubles and it showed as they were able to get wins at the #1 and #3 positions. Knowing that going down 3-0 after the doubles is almost impossible to come back from, Jeff and Max had the pressure on them as they were locked in a tight match at #2. The good thing was they had been in this situation before, having everyone watching them, knowing a huge momentum swing would occur with the outcome of the match. Down match points on Max’s serve, he hit two of his biggest serves of the match to pull them out of the hole and eventually win a long deuce game. 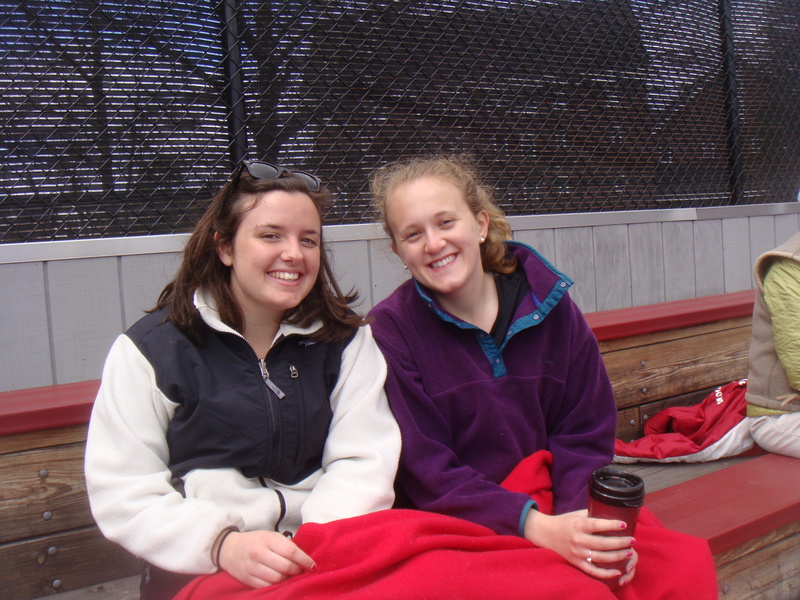 They would then go into the tie-break and unlike the Brandeis match where they got ahead early; they would have to fight back and forth against the Big Red duo. But as most Cats’ fans who follow the team know, there was never any doubt Jeff and Max would find a way, and they did with the 7-5 win. You could see the spirit taken out of the Denison team just a little knowing they were so close to a 3-0 lead and at the same time confidence was restored to the Cats. Four wins in the singles matches would be no problem, but where would those four wins come from. The first would come from Max at #3. He took the momentum he gained from his great play in doubles and imposed his will on his opponent from the first ball. He really showed his leadership in this match by getting the Cats two very important matches. Bettles at #4 would be the next, giving the Cats a 3-2 lead. Bettles winning in singles would become a recurring theme of the weekend. Amrit riding a five match win streak would make it six in a row with his win over Tom Cawood, 6-0, 6-4. Jeff playing at #6 would follow Max’s lead and get his second win of the day to clinch the 5-4 win for the Cats. It was his most complete singles match of his career winning in dominating fashion, 6-2, 6-2. It’s always an impressive win when you are down 2-1 after the doubles, plus you add the fact of playing on the road in a routy environment, the Cats could feel good about this win. They couldn’t enjoy it for long though as they traveled to Kenyon the next afternoon. Kenyon, ranked #6 nationally, would be a good test for the Cats allowing us to face a top ranked opponent early in the season that is not in the NESCAC. The Cats got off to an early lead with Bettles and Rupa winning at #1 doubles 8-5 against Greenberg and Brody. Both the #2 and #3 matches were close early, but the Lords found their stride and came back to get the 2-1 lead after doubles. The Cats still felt confident knowing they had just come back from the same deficit the day before. 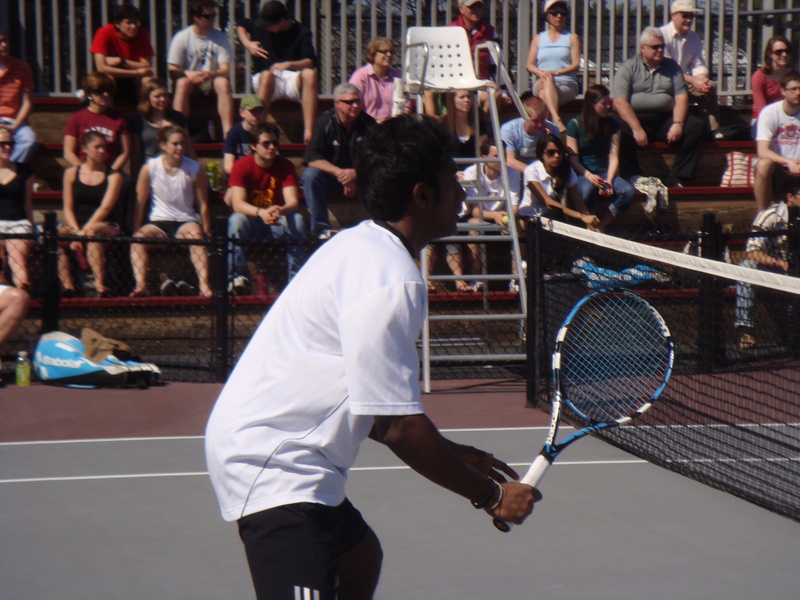 Amrit, who was going up against 2008 singles national champion Mike Greenberg, played an excellent set and a half. Greenberg then picked up his play and Amrit started to cramp in the third set and couldn’t get the victory. It was an exciting match that had the boisterous Kenyon crowd out of their seats. The match at #2 between Reiss and Polster was also entertaining, full of long points and plenty of winners from both sides. 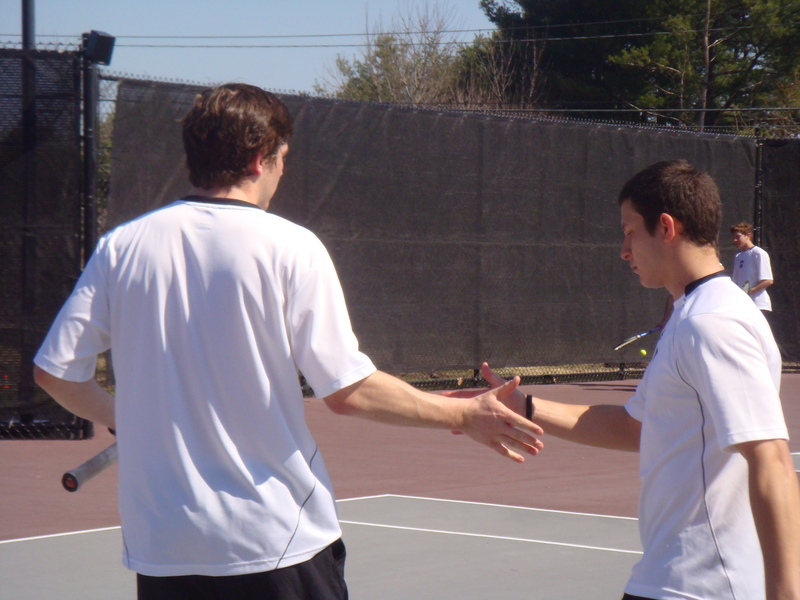 Polster was able to get the victory for his team after almost two hours of tennis. Bettles would get the only win for the Cats in singles after digging deep to stay in the second set. After being down set points he was able to force it to a tie-break and get the W. Jeff played another excellent match and had his chances at #6 losing 7-6, 6-4. The Cats knew this would be a tough match to win, but also knew the purpose of playing the match was to get us ready for the NESCAC schedule ahead, which is exactly what it did. Case Western Reserve traveled down from Cleveland to meet us at Kenyon on Sunday morning. Even though this was the lower ranked of the three teams we played in Ohio, we knew it would not be an easy match with this being the third match in as many days. The key would be to get off to a fast start, which is exactly what we did in doubles. 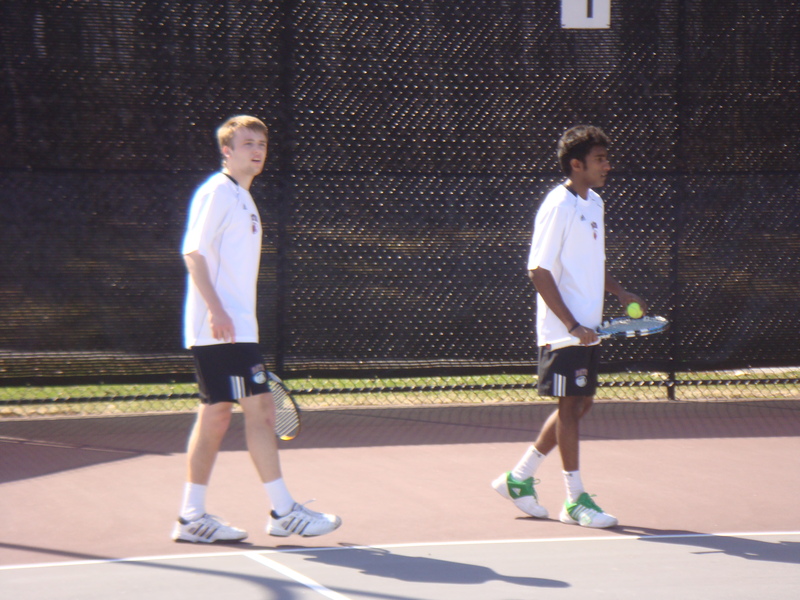 Amrit and Matt won easily at #1 and Jeff and Max continued to play well taking their match 8-4. This gave the Cats a 2-1 lead going into the singles, something they hadn’t had so far on the trip. Max and Matt were all business as they each won without losing a game. 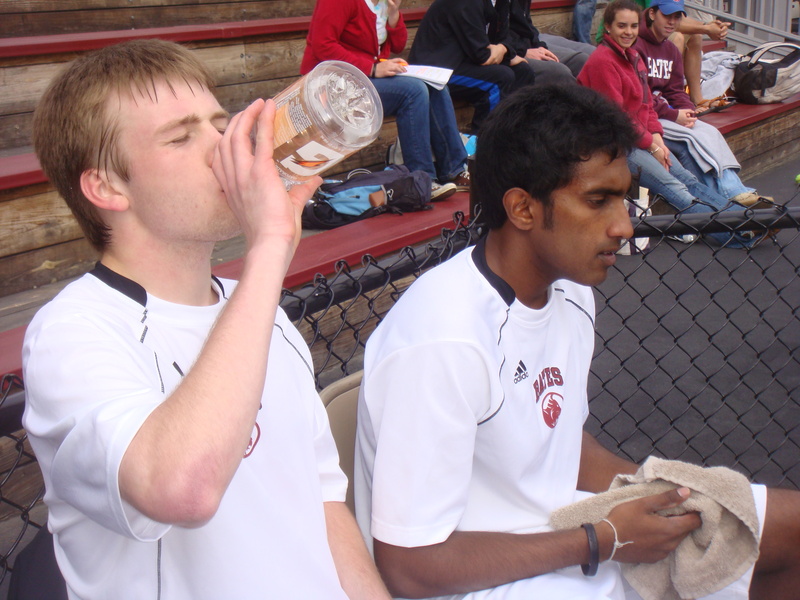 Winning 6-0, 6-0 is not easy in a college match, so this was an impressive feat on weary legs. 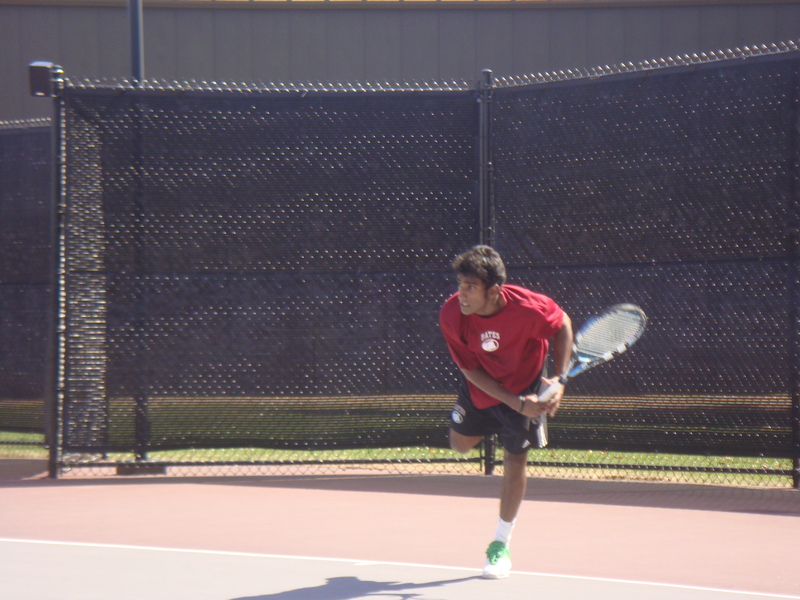 Amrit clinched the match with his win at #1 and is now 7-1 in singles on the season. Jeff fought through a set deficit and an injured leg to win his match 10-6 in the match tie-break. Fenno finished off the winning for the Cats when his opponent had to retire two points away from defeat because of a knee injury. So the Cats hustled to the airport to catch their flight back to Boston having gone 2-1 on their trip to the Midwest. Everyone was tired as we finally arrived back to campus, but it was still a good feeling knowing the trip had been a job well done. 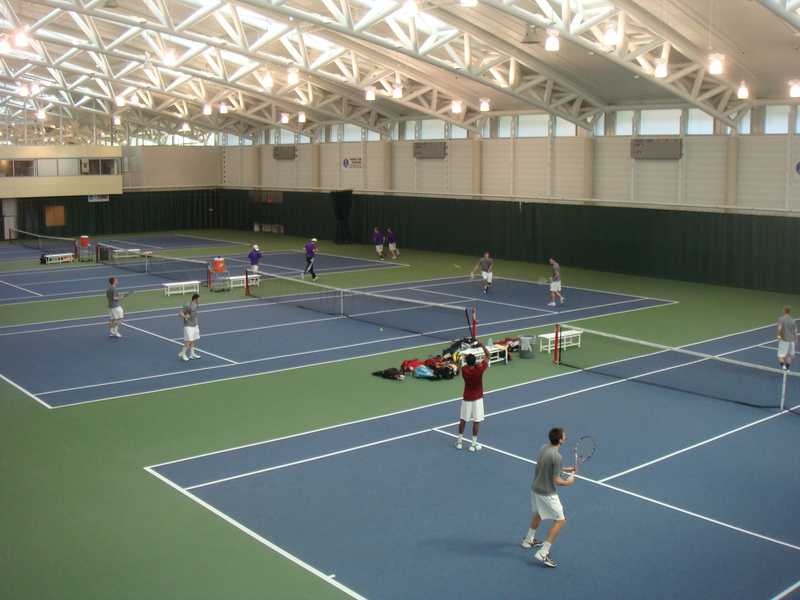 It prepared us for our upcoming matches, especially for Middlebury who will visit the Wallach Center this Saturday morning ranked #1 in the nation.